(L–R) Levi Lebo, Danielle Marriott, Carri Wakefield and Joshua Asher exude a sludgy sense of melody in their folk-turned-rock music. Dark and gloomy doom is the order of the day on Oct. 12. Come chill with the heavy, meandering drone rock of Dustbloom, and meditate with the melancholic vibes of Light/Black. Before all of that, get your groove on with the driving jam punk of openers Baby Gurl. Tickets are just $5, and the 21+ show starts at 9 p.m. at Urban Lounge, brought to you by Bohemian Brewery and hosted by SLUG’s Ischa B. If you are immobile or underage, be sure to catch the show on gigviz.com. When the members of Light/Black talk about their origins, everything seems to circle around a single couch. Everyone agrees that Carri Wakefield (bass/vocals) was the first one to stake out her space on the couch, writing fragments of new material on an acoustic guitar. “I’ve played in previous bands where I sang or I played bass, and I was kinda taking a break from being in a band. I decided to [play again] because I was bored and wanted to and missed it—to write some acoustic folk songs, like ‘singing around the campfire’ kinda stuff,” she says. As the material matured and grew more refined, however, Wakefield found herself getting drawn back into writing music more seriously. Nowadays, Light/Black sounds like a mix of drone sound textures with a sludgy sense of melody. The band tries to avoid pretense in describing their sound, preferring to simply refer to themselves as “loud.” They shy away from being categorized in specific genres, describing the project as dark folk—a response to their mellower, more minimalist rock style. This simplistic, no-frills attitude seems to remind them of their humble beginnings: a couch-born band without dreams of stardom, only a will to create something meaningful, personal and fun. Lebo says he would prefer people to listen closely to their lyrics rather than for the markers of a particular musical style. He says, “I would love it if someone said, ‘This line in this song was really awesome.’ Most people don’t say that. As much as people listen to and relate to lyrics, a lot of the time they’re just ignored.” The entire band collaborates on lyrical content, so the lyrics are especially important to everyone. 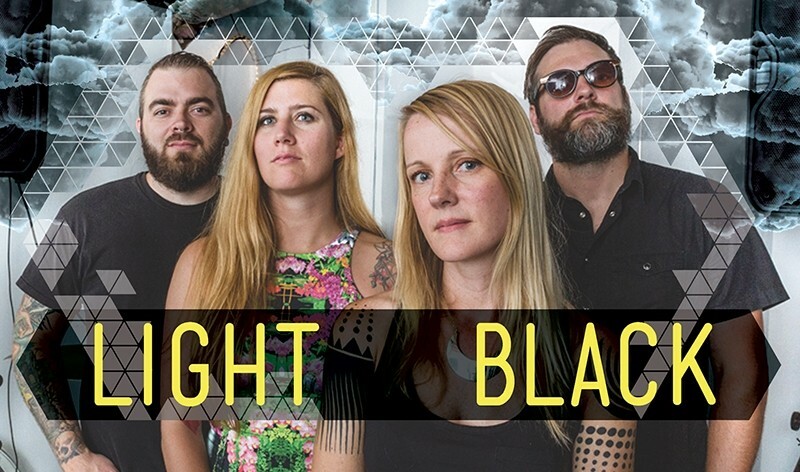 Be sure to check out Light/Black at lightblackband.bandcamp.com and catch them at Localized!